I offer support services through virtual organizing. To keep the process simple one room will be discussed at a time. 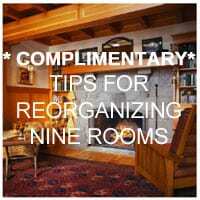 There is an initial session cost for each room to be organized. You study the plan, then a question and answer session can be booked to clarify the plan and establish a timeline for the project. This session will last about 15 minutes. The initial session cost is $150.00. This works well for people who manage their time well and are motivated to get the job done. The cost of option 1 is $10.00 for each 15 minute consultation requested. A retainer of $30.00 is paid in addition to the initial session cost at the beginning of the job. Additional retainers can be purchased as needed. This works well for people who are easily distracted or procrastinate in getting the space organized. You will e-mail me the day and time you will be working on the plan. I will e-mail, Skype, text or call each hour to see what assistance you need in order to successfully complete the work scheduled for that day. The cost of option 2 is $5.00 for each 5-minute check in call. For example, if you are planning to work from 12:00-3:00 on the job then I will contact you at 1:00, 2:00, 3:00 and the cost of the session in $15.00. A retainer of $30.00 is paid in addition to the initial session cost at the beginning of the job. Additional retainers can be purchased as needed. Format B – For clients who don’t like to work alone. 3) Book Virtual Organizing Work Sessions to begin organizing together. I will be on my computer for the entire length of the appointment teaching you skills, keeping you focused and supporting you. At the end of the days session we will book the next appointment and continue working until the job is completed. The cost is $45.00/hour. You will be invoiced and payment must be received before the session begins.